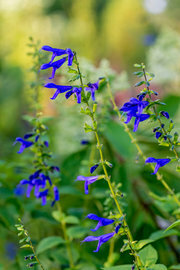 Sometimes when I am weeding in the late afternoon, I hear the vibrating wings of the ruby-throated hummingbird before I see it dipping its beak into the long tubular flowers of the blue anise sage (Salvia guaranitica) called Black and Blue for its cobalt-blue petals and near-black calyxes at the base of the flowers. Hummingbirds are shy, but if I remain perfectly still, it is usually so intent on the nectar inside those deep blue trumpets that I can admire it out of the corner of my eye as it backs out of one flower and moves on to another. Then, in a flash of iridescent green and red, it is gone. Anne Raver, In The Garden, The New York Times, August 20, 2014. I really like this post. Images are beautiful on your blog. I sense a love for nature in you. Thank you! I like the photos on your blog too.